The distinct keel of a juvenile Aegopis. A view of an Aegopis verticillus' head with the long tentacles. 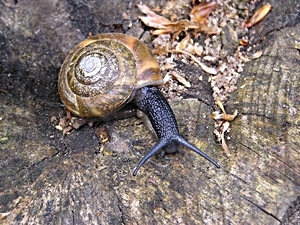 Source: Mollbase on http://www.mollbase.de/list/ and Fauna Europaea on http://www.faunaeur.org. 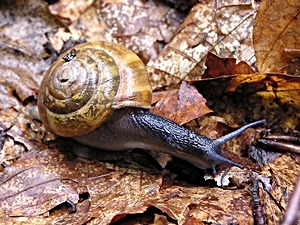 Aegopis verticillus is a large kind of true glass snail characteristic for the Vienna woods hill country west and south-west of Vienna, where the large snails with the glossy shell can be found in humid places in the forest. This snail species' shell is roundish and conical with an elevated spire. While the outermost whorl in adult shells displays a blunt keel, there is a sharp one in juvenile shells, so those have been confounded in their fossil state with shells of the lapidary snail (Helicigona lapicida). 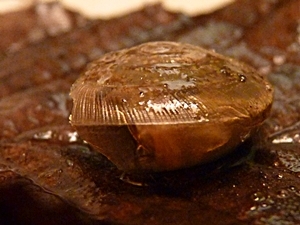 The glossy horn coloured shell of Aegopis verticillus has a grid-like surface structure from criss-crossing longitudinal and transversal stripes. Transversally to the whorls, lighter coloured zones can be seen, marking previous pauses in shell growth (winter, aestivation in summer). 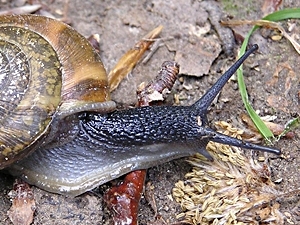 Those yellowish zones are characteristic for Aegopis verticillus and can be seen in a similar way in the Illyrian rock snail (Faustina illyrica). Dimensions: Height: 16 - 17 mm; Width: 26 - 30 mm; Whorls: ca. 6. 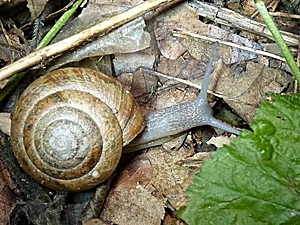 The snail itself is slender with a narrow foot sole. It has a light to dark grey colour, some almost black, with a musty yellowish hue at the flanks. The tentacles are very long. Like most true glass snails (Zonitidae), Aegopis verticillus also is at least an omnivore. It feeds on dead plant matter, but also on carrion and smaller snails, but especially their eggs. south of Vienna. Picture: Martina Eleveld. Aegopis verticillus in its deciduous forest habitat can be found under fallen leaves and between stones on humid ground, as well as where a stream disappears in the ground. Usually the species is found in hillside and mountain areas in lower altitudes. Dry periods the snail waits out dug into loose earth. The species' distribution area stretches from Bosnia, Montenegro and Hungary to the eastern Alps, the Carinthian and East Tyrolean Alps and the Salzburg Alps. In a disperse manner, the species appears as far as the Moravian hill country. In Italy, the species is distributed in the south in Calabria. There are single German populations, for example near Marktschellenberg in the Berchtesgaden country, in the Salzach valley and in the southern Bavarian woods. In 1880, Aegopis verticillus was introduced by man in Landberg on Lech. In Germany, the species is classified as vulnerable (VU) (see also: IUCN Threat Categories). Francisco Welter-Schultes: Aegopis verticillus species homepage.